Waimea (also know as Kamuela, find out why) is the biggest town on the North side of the Big Island. This part of the island is made out of the oldest of five volcanoes that make up the Big Island: Kohala. The climate here at 2500+ ft sometimes reminds of the Scottish highlands, with temperatures on average a bit cooler compared to the rest of the Island, and low clouds often obscuring the rolling lush pastures. Waimea is Paniolo country, and home to some of the most stunning hikes on the Big Island. 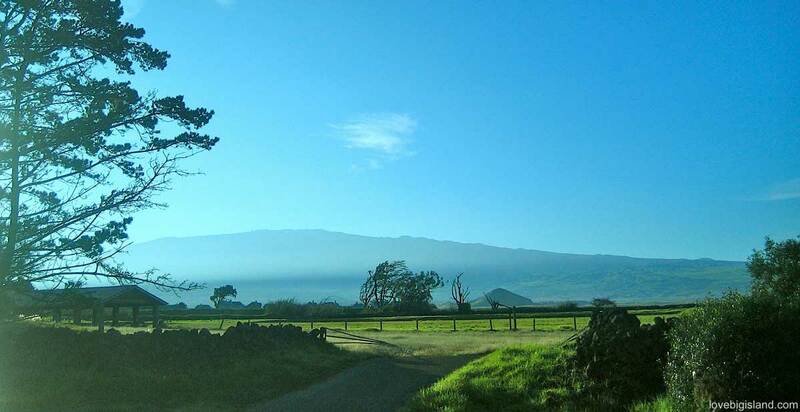 Paniolo’s are the Hawaiian cowboys, and Waimea is a great place to saddle up and explore the rolling hills or rugged coastline on horseback or with hiking boots! Until recently, Waimea was a company town and its life was largely determined by the Parker Ranch. With 135.000 acres, the Parker Ranch is now one of the biggest cattle ranches in the United states. There lingers still a strong ranch-town atmosphere in Waimea. You can sample it in the many restaurants, gift shops and cowboy clothing stores that thrive in this community. If you are visiting around the 4th of July, don’t miss the Parker Ranch Rodeo held at the Paniolo Park in Waimea! Why is Waimea also called Kamuela? There are 3 different Waimea’s in the state of Hawaii. One valley on O’ahu, one village on Kauai, and Waimea on the Big Island. Because this is confusing a naming committee was formed to choose another name for Waimea. They decided to honor the Parker Family, who owns much of the land around Wiamea and has played a big part in Hawaiian history. “Kamuela” is the Hawaiian equivalent of “Samuel”. Samuel Parker (1853 – 1920) has a 3/4 native Hawaiian heritage and played a large role in Hawaiian politics during the assimilation of Hawaii into the United States. Waimea is still the official name of the town, and if you speak to locals or read the road signs, Waimea is all you will see or hear. The only time that you will need to use ‘Kamuela’ Is when you will be sending letter by mail, or are researching information on Waimea online! There are three farmers markets in Waimea where you can buy delicious fresh local products and a good breakfast. Market days are Saturday and Wednesday. You can find more information on Waimea’s farmers markets here. Waimea is a short drive from Kailua-Kona, and is accessible with free public transport via the hele-on bus. Hilo (56 miles, 1 hr 20 min), Kona (40 miles, 1 hr 10 minutes), and Volcano Village (85 miles, 2 hr 10 min) are all easily reachable by car. There are several “Waimea’s” on the Hawaiian Islands. One Waimea is located on the Island of Kauai. Waimea Bay (the world-famous surf spot) is located on the Island of O’ahu. Finally, The Waimea you are reading about now is located on the Big Island. 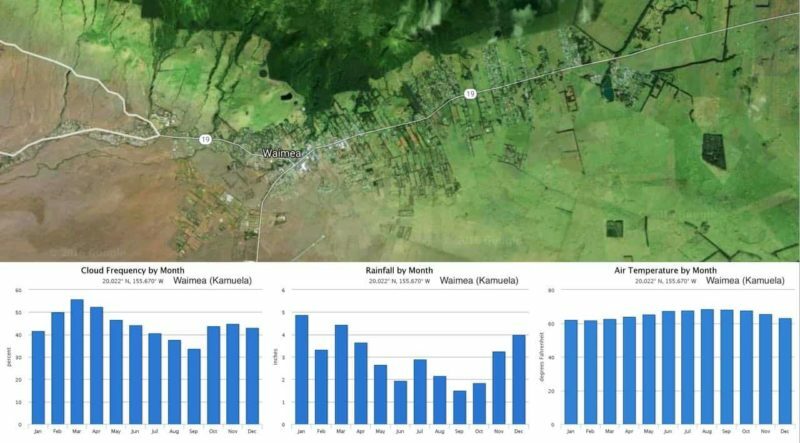 If you want to see what the weather in Waimea means for your visit to Hawaii, check out the monthly average weather for Waimea. You can find information at that page on the average temperature, the hours of sunshine, the number of cloudy days, and precipitation. For the current weather conditions and weather forecast for Waimea, have a look at the NAOO forecast. We have added what we think are the most important stops and activities in and around Waimea on an interactive map. This map lists our highlights for the town of Waimea. Click any icon to find more information about that local activity, shop, or hotel/vacation rental.